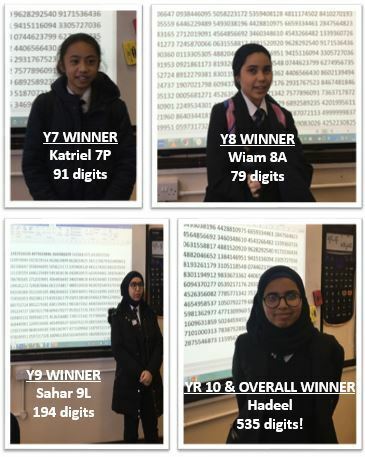 A MASSIVE WELL DONE TO ALL THE GIRLS WHO TOOK PART IN THE PI DIGITS COMPETITION. A massive shout out to Sahar 9L who came 2nd place reciting 194 digits of Pi! Well done! Keeping us on the edge of our seats and winning 1st place with an unbelievable 535 digits was Hadeel 10T.